Auxiliary – Horace Orr Post 29, Inc.
Horace Orr Post 29, Inc. Learn about all of it right here. Georgia Boys State is a comprehensive one-week course in state and local government conducted by The American Legion Department of Georgia. Georgia Girls State is a similar but separate program, conducted by The American Legion Auxiliary Department of Georgia. Both programs are open to high school students who have completed their Junior Year. The 2019 session of Boys State will begin May 26, 2019 and conclude June 1, 2019. Boys state will be held at Riverside Military Academy in Gainesville, Georgia. The 2019 session of Girls State will be June 9-14, 2019 at Georgia Southern University in Statesboro, Georgia. Boys State and Girls State are Leadership Action Programs where qualified high school rising seniors take part in a practical government course. The program is designed to develop a working knowledge of the structure of government and to impress upon the citizen the fact that our government is just what we make it. New door cards will be distributed to all current members in February. Members of Legion, SAL, and Auxiliary units will be on site in the Social Quarters February 14th and 15th, approximately 11AM-4PM. Cards will be provided based on official membership logs for 2019. After the 15th, new door cards can be obtained from the on-duty bartender by showing a current, valid membership card. We are hosting the 5th District meetings at Post 29 this Sunday. See the details below. The post will conduct normal hours and business for our members, but please be mindful the post may be crowded with Legion Family members from around the District. Thank you. ** Breakfast will be provided – a $6 donation is requested. The regular monthly meeting will be held Thursday, February 7th at 7:30pm. Join us at 6:30pm for a delicious dinner. Eboard will meet Tuesday the 29th, at 6:30PM. Travis Golliver arrived on Wednesday, January 9, 2019 at 2:49 am to Scott Golliver and Nicole Lynch. 8 lbs. 8 oz. and 22 inches long. All are well. SAL membership for Travis was completed within 14 hours of his arrival. Congratulations to Scott and Nicole, and to grandma Ellen. I thought I would follow up on the “call for volunteers” that you sent out on behalf of Toy’s 4 Tots at the Marietta collection center. Past Commander William (Bill) Beaudin and his wife Lorri (Auxiliary Unit 29) volunteered several hours each on 12/14, 17 & 18. Legionnaire David Thomas and his son Austin on 12/14 volunteered for several hours each. Sandy Thompson (Auxiliary Unit 29) volunteered several hours per day from 12/17 through the 21st. She also volunteered on Christmas Eve along with a friend that she brought with her to help. Jerrie Clark (Auxiliary Unit 29) put in several hours per day from 12/17 through the 20th. She brought a friend with her on the 17th also. Jackie Brodie (Auxiliary Unit 29) worked a few hours a day from 12/17 through the 21st. Legionnaire Robert King volunteered for several hours on both the 20th & 21st. I (Auxiliary Unit 29 & member of ALR Post 29) volunteered for 70.5 hours. A couple of days early in November (8 hours). The remainder of my time (62.5 hours) was spread out between December 4th and the 24th. Thank you to all who answered the call and put in the hours to help us complete the mission. 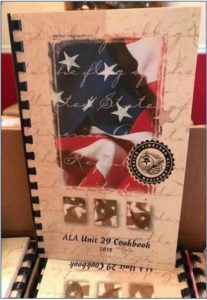 ALA Unit 29 has produced a wonderful cookbook, just in time for the holidays. Packed with 150 delicious recipes from our very own members, these gems will make great gifts for the cook in your life. Limited supply, so get yours soon. $12. The monthly meeting (Legion and Auxiliary) will be Thursday December 6th at 7:30PM. Come early for dinner at 6:30PM.